Serve up some 2% Jog (Reduced Fat) Milk in a cold glass, or add it to a recipe for a healthy serving of protein and calcium. Jog Milk from Clover Farms has reduced fat and calories, but still keeps much of the rich, creamy flavor of whole milk. Did You Know? There are 40,000+ licensed dairy farms in the U.S., and they are home to 9.4 million cows. Pennsylvania’s 525,000 cows produce more than 10.8 billion pounds of milk annually. That works out to about 2,454 gallons per cow! We have more dairy farms (6,570) than every other state except Wisconsin (9,090), and 99 percent of them are family owned. If you love milk, it may be one of the healthiest addictions you could have. It’s a great source of protein, calcium, Vitamin A, Vitamin D, Vitamin B12, potassium, phosphorus, riboflavin, niacin, and other beneficial nutrients and is the perfect blend of carbohydrates and protein. About Us: Clover Farms was established in 1937 in the rich, rolling hills of Pennsylvania Dutch dairy country. Our milk gets its unique great taste from our dedication to quality monitoring, careful processing, and attention to detail in packaging. For more than 80 years, we have maintained a tradition of quality, freshness and flavor in each refreshment bearing our name. Our 170 farm families work hard to provide the best milk available, enabling us to supply you with premium quality dairy products. Try some today! 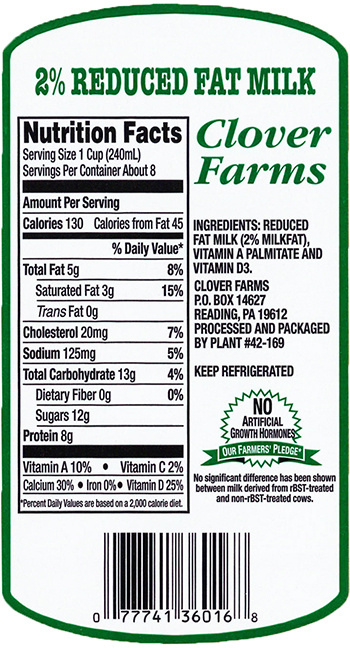 Clover Farms 2% Jog Milk is always fresh and tasty, even when we reduce the fat!